To be the regions premier, profitable, independent construction related provider. Achieving this by continually seeking improvement while maintaining the highest level of integrity. To surpass the expectations of our customers by building loyal relationships through services of the highest quality and value. To attract, develop and promote employees who demonstrate a genuine commitment to our success. To be an active contributor to the community in which we do business. An Overview of The Ansonia Lumber Co.
Ansonia Lumber Company has been located at 300 Main Street, Ansonia, Ohio since 1909. G. H. Rehmert was part owner and manager at the time and he hired George Klipstine Sr. in 1921. G. H. Rehmert promoted George Klipstine Sr. to manager of the company December 8, 1921. George was succeeded by his son George Klipstine Jr. who built a solid company for his sons John and Bill Klipstine who managed the company to January 1, 2010. John and Bill Klipstine were succeeded by Todd and Tammy Klipstine and Krista and Tony Spence (Todd’s sister and brother in law) who are the current managers of the Ansonia Lumber Company. The company has grown from four employees to what it is today. 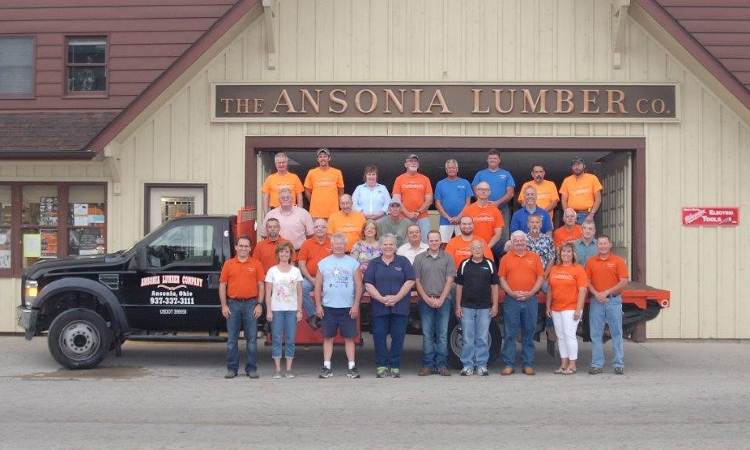 Ansonia Lumber Company’s current customer offerings include Home Improvement, Agricultural Building, Kitchen, Bath, New and Replacement Windows and Doors and Design products and services.